California Hikers Spot A Rusty Old Metal Can Sticking Out Of The Ground… Today They Are Retired. On a brisk morning last February, a Northern California couple set out with their dog to hike one of their favorite local trails. It was actually a trail on their very own property. Property they came very close to losing recently due to economic hardship. This trail was one that they had hiked hundreds, possibly even thousands of times before. As you are about to learn, this particular day was special. As fate would have it, the unsuspecting couple in their 40s was about to stumble upon buried treasure. A literal bonanza buried just a few inches off the beaten path and just a few inches below the dirt's surface. The found treasure ended up being valuable enough to change their lives forever. This is seriously one of the coolest stories we've ever posted. After reading it, you may be inspired to move to Northern California and start hiking every day. This all took place on a brisk February morning in a town roughly 50 miles northeast of Sacramento. The exact location is still being kept a secret for reasons you're about to understand. At some point during the hike, the woman spotted an unusual-looking object sticking out of the ground just a few inches off the beaten path. Erosion from rain had caused what appeared to be the top of an old rusty can to pop out of the dirt. She used a stick to clear away dirt and unearth the can. But who cares about finding some rusty old cans, right? Probably just some discarded garbage that had been rotting there for years, right? Well, did we mention that this hiking trail happens to sit in the heart of what was once the epicenter of the 1850s-era California gold rush? After removing the surprisingly heavy can from the ground, the couple returned to their house to examine the contents. They removed the top and stared at its contents in disbelief. To their utter shock and amazement, that rusty old rotten can happened to be filled to the brim with gold coins. 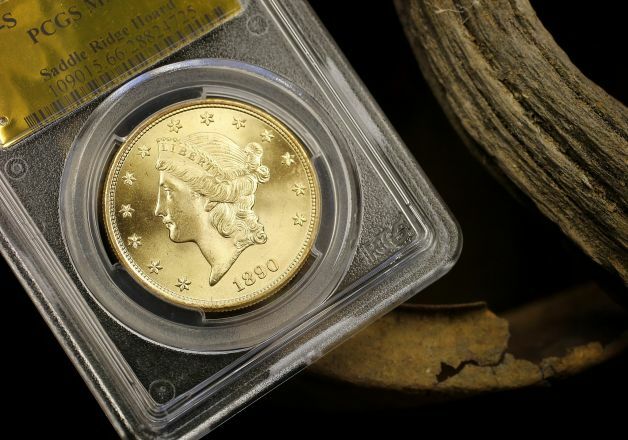 The very first coin they pulled out was a $20 denomination from 1890. They immediately ran back to the spot where they discovered the can and began digging. They ended up finding five more cans just below the dirt's surface. Each can was filled to the brim with gold coins. 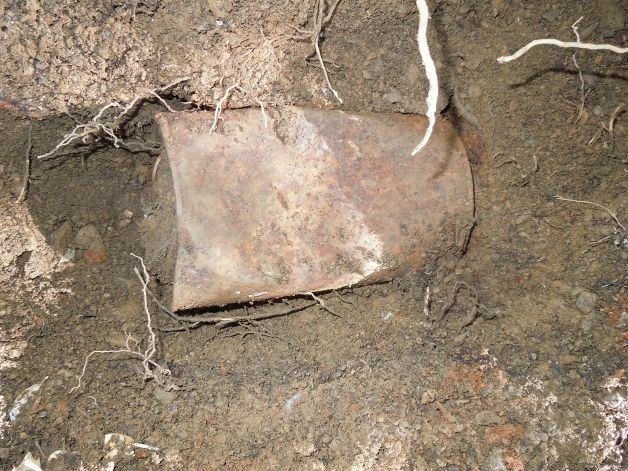 After unearthing each individual canister, the couple pried open the tops with a stick. 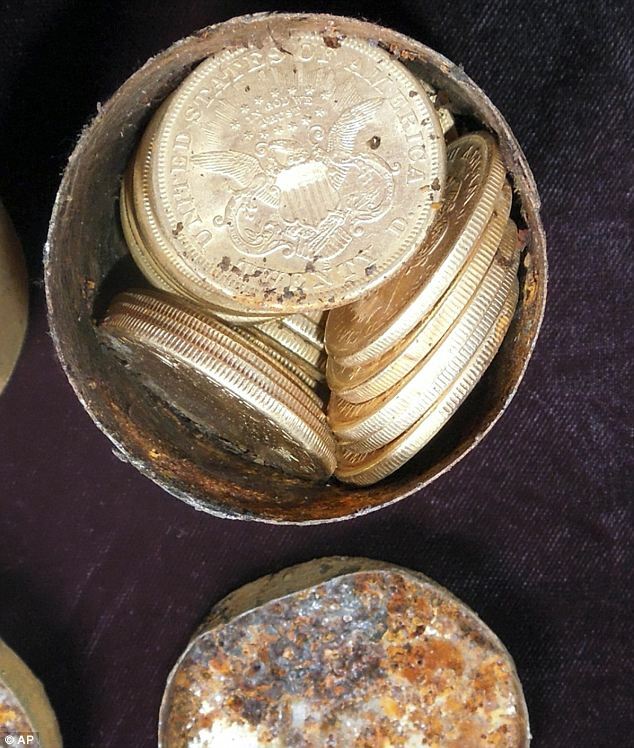 When it was all said and done, the lucky hikers had stumbled upon a bonanza of 1,427 solid gold coins dating between 1847 and 1894. That's right around the peak of the Gold Rush. And because gold is one of the few elements that doesn't rot or deteriorate, with just a little bit of elbow grease all 1400 were quite literally back in mint condition. The discovery is believed to be the biggest hoard (which I just learned literally means "hidden treasure") of gold that has ever been found in the United States. The coins came in $5, $10 and $20 denominations and were mostly minted in San Francisco, but some came from as far as away a mint in Georgia. They were also nearly stacked in order of denomination which broke down to 1,373 $20 coins, fifty $10 coins and four $5 coins. At today's price per ounce of $1336, if the coins were melted down the couple's gold would reportedly be worth $28,000. Not a bad haul for kicking up some dirt on a random hike! But wait. We said this couple's lives were changed forever. In the article title we said "Today They Are Retired". You can't retire off $28,000. Something's not adding up. 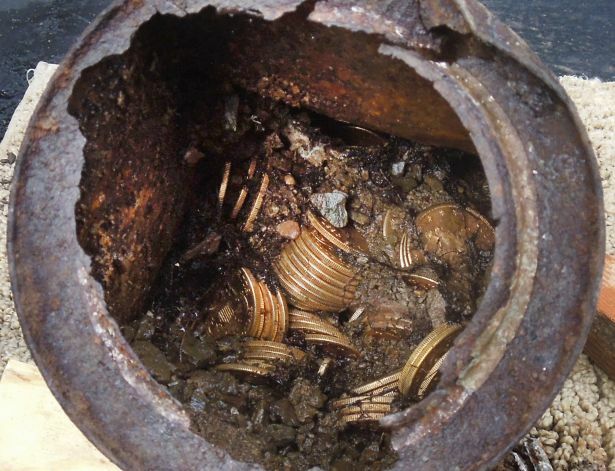 Well, as it turns out, not only did the couple find 1,427 cold coins, but many of them happened to be extremely rare and extremely valuable. 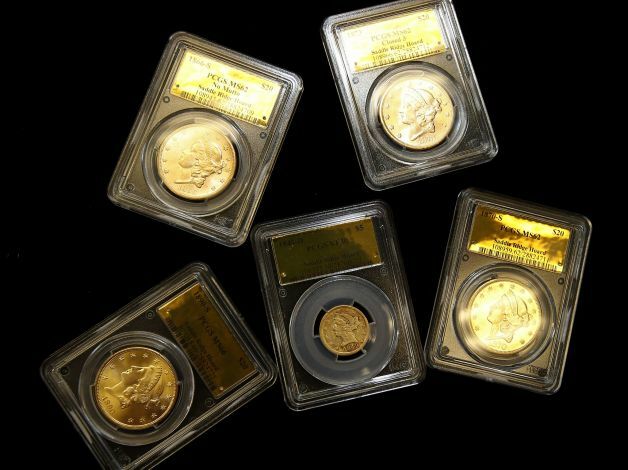 Several of the coins are rare enough that coin experts expect them to fetch over $1 million a piece at auction. After each coin is auctioned, this lucky couple's final haul is expected to easily top $10 million. Eureka!!! 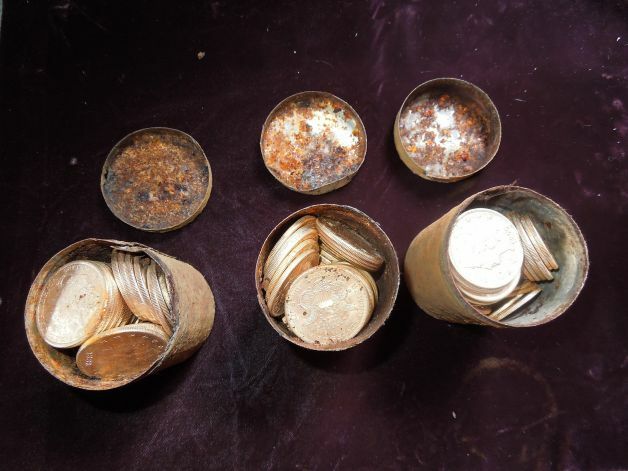 After consulting with a local coin expert and hiring a lawyer, the couple stacked the coins into a cooler and buried the haul under their fire wood pile. "It was a very surreal moment. It was very hard to believe at first. I thought any second an old miner with a mule was going to appear." When you try imagine what might have caused someone in the late 1800s to bury a treasure like this, the mind can start to run wild with fantastic scenarios. Were the coins stashed away by some stage coach robber then hidden until the heat wore off? Were they buried by some crazy millionaire who didn't trust his family? Are there dozens, perhaps hundreds more canisters filled with coin lining that very same hiking trail? Please tell me someone is working on this screenplay. Preferably starring Nicolas Cage. "Like a lot of people lately, we've had some financial trials. I feel extreme gratitude that we can keep our beloved property. We love our lives as they are." Sooooo… Anyone want to start a hiking club in NorCal with me? Actually never mind. Hiking is lame. Keep doing what you do. Forget I said anything.